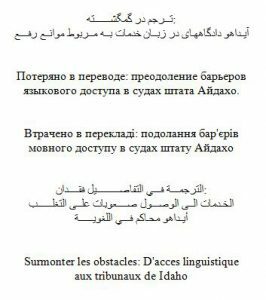 Whether it is Farsi, Russian, Ukrainian, Arabic or French, the court system must overcome the barriers associated with the diverse selection of languages spoken in our communities. Join the Diversity Section for this program on the practical aspects of providing language access in Idaho’s courts. This event was posted in Continuing Legal Education, DIV Section Sponsored CLE, Diversity Section, Practice Sections by Lindsey Welfley.